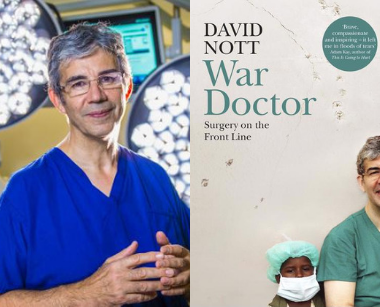 Join us on Thursday 28th February to hear David Nott's extraordinary story. But as time went on, David Nott began to realize that flying into a catastrophe – whether war or natural disaster – was not enough. Doctors on the ground needed to learn how to treat the appalling injuries that war inflicts upon its victims. Since 2015, the foundation he set up with his wife, Elly, has disseminated the knowledge he has gained, training other doctors in the art of saving lives threatened by bombs and bullets. Tickets include a drink on arrival and a chance to purchase a signed copy of the book at a discounted price.